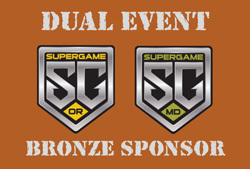 SuperGame DUAL EVENT SPONSOR for both the Oregon and Maryland SuperGame events - BRONZE Sponsorship/Booth - $375 cash or $750 in prizes. You get your name listed as a sponsor but no logo or link and no banners. If you attend the event, you get a 10x10' space under a tent with a table and a chair. You are allowed to sell anything except paintballs and food or drinks.